The Invacare HomeFill oxygen system defines home care oxygen by allowing patients to fill their own high pressure oxygen cylinders from an oxygen concentrator from the convenience of their own home. 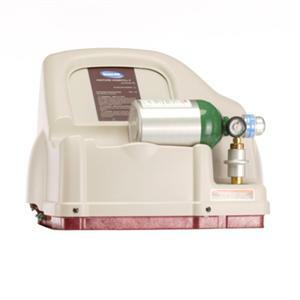 The Invacare Home Fill is a multi-stage pump that, simply and safely compresses oxygen from any Invacare HomeFill System compatible 5 liter or 10 liter oxygen concentrator into oxygen cylinders in sizes M2, ML4, ML6, M6, M9(C) and D.
The Invacare Home Fill II gives users the ability to fill their own oxygen cylinders, giving them greater independence and freedom. With the Invacare HomeFill II, patients will never have to depend on providers for their oxygen needs. The Invacare HomeFill II oxygen system will revolutionize home care oxygen by allowing patients to fill their own high pressure oxygen cylinders from an oxygen concentrator in the comfort of their own home. The Invacare Home Fill is extremely user friendly with connection and controls designed for easy operation. The Invacare HomeFill II can fill oxygen cylinders while the user continues to receive oxygen from the oxygen concentrator. The small, lightweight design makes the Invacare Home Fill oxygen system the perfect home care addition for oxygen users. HomeFill connection and controls are designed for ease of operation. Home Fill allows cylinders to be filled while patient continues to receive oxygen from the concentrator. HomeFill II gives ambulatory patients greater freedom and independence. Small and lightweight design is easy to store and transport. NOTE: For more detail please call Go Southern MD Customer Service at 1-855-412-6600.